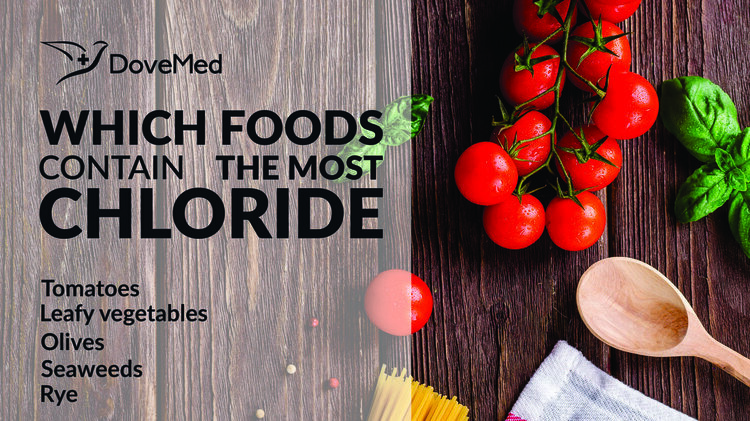 Which Foods Contain The Most Chloride? Chloride is a component of table salt or sea salt, which is also known as sodium chloride (NaCl). It is an important body electrolyte found in blood. Chloride is responsible for keeping fluid balance within cells and maintaining pH levels, pressure, and volume of blood. Chloride is a component of table salt or sea salt, which is also known as sodium chloride (NaCl). It is an important body electrolyte found in blood. Chloride is responsible for keeping fluid balance within cells and maintaining pH levels, pressure, and volume of blood. It is also indispensable to gastric juices (as part of hydrochloric acid), which aid in digestion in the stomach. Chloride, potassium, and sodium are vital minerals that are essential for the conduction of electrical impulses through the nervous system. Chloride imbalances may occur due to excessive diarrhea and vomiting, causing a loss of electrolytes. Since excess salt is excreted through urine, a heavy salt intake can damage the kidneys. A condition of deficient chloride levels does not normally occur in adults. High chloride or low chloride blood levels can be indicative of a host of disorders, such as metabolic disorders, kidney disease, certain respiratory conditions, congestive heart failure, etc. that may be life-threatening. Hence, it is very important to maintain optimum chloride levels in the body. The American Food and Nutrition Board recommends a daily intake of 2.3 grams of chloride for an adult to make up for the lost salt through sweat. The minimum required amount of daily chloride intake for an average adult is between 0.75-0.90 grams, of which, over 0.50 grams is lost per day. We get most of our chloride through salt (either table salt or sea salt) that is used during the preparation of food. However, an excess intake of salt or sodium chloride may lead to high blood pressure, severely affecting the cardiovascular system and the kidneys. Olives: The olive is a small tree that is found primarily in the Mediterranean region and parts of Europe and China. The fruit of this tree is used to extract olive oil, which is used in many culinary preparations. Rye: It is a grain grass related to the wheat and barley family. Rye is used to prepare alcoholic beverages like whiskey, beer, and vodka. In addition, rye flour is used to make rye bread. Many processed foods and snacks contain a high sodium levels, thus implying that the chloride levels are also high. These include salted nuts, chips, sauces, canned food items, butter, salted meat and fish, pickles, burgers, sandwiches, cheese, tomato ketchup, bacon and ham. Nevertheless, despite the above, it is always recommended to take the advice of a suitable healthcare professional before bringing any alteration to your regular food habits and diet. Weast RC, ed. CRC handbook of chemistry and physics, 67th ed. Boca Raton, FL, CRC Press, 1986. Miller, J., Whiteley, S., James, L. J., & Evans, G. (2014). Re-establishing fluid balance after exercise induced dehydration: the effects of a sodium chloride solution and water when consumed with food. In Proceedings of The Physiological Society. The Physiological Society. van Buren, L., Dötsch-Klerk, M., Seewi, G., & Newson, R. S. (2016). Dietary Impact of Adding Potassium Chloride to Foods as a Sodium Reduction Technique. Nutrients, 8(4), 235. Feltrin, A. C., Souza, V. R., Saraiva, C. G., Nunes, C. A., & Pinheiro, A. C. M. (2015). Sensory study of different sodium chloride substitutes in aqueous solution. International Journal of Food Science & Technology, 50(3), 730-735.
de Souza, V. R., Freire, T. V. M., Saraiva, C. G., Carneiro, J. D. D. S., Pinheiro, A. C. M., & Nunes, C. A. (2013). Salt equivalence and temporal dominance of sensations of different sodium chloride substitutes in butter. Journal of dairy research, 80(03), 319-325. Huynh, H. L., Danhi, R., & Yan, S. W. (2016). Using Fish Sauce as a Substitute for Sodium Chloride in Culinary Sauces and Effects on Sensory Properties. Journal of food science, 81(1), S150-S155. Wu, H., Zhang, Y., Long, M., Tang, J., Yu, X., Wang, J., & Zhang, J. (2014). Proteolysis and sensory properties of dry-cured bacon as affected by the partial substitution of sodium chloride with potassium chloride. Meat science, 96(3), 1325-1331.